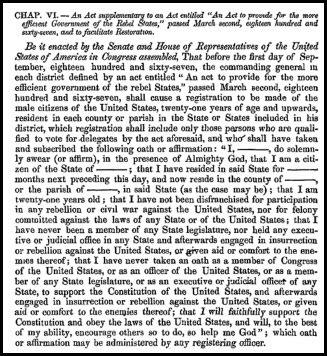 It was March 1867, and the Congress of the United States wanted to restore peace and good order to the states that had been in rebellion: Virginia, North Carolina, South Carolina, Georgia, Mississippi, Alabama, Louisiana, Florida, Texas and Arkansas. But that wasn’t enough. The Congress also wanted civilian governments restored, and that meant having loyal citizens vote for new governments, and — to do that — it wanted a list. Now any time a list like that is required, it means one thing to a genealogist: records. And in this case wonderful records: records of all adult male voters in the southern states who weren’t disenfranchised by their active insurrection. For anyone with ancestors in the former Confederate states, the records of these Civil War-era voter registration are a treasure trove. Ages weren’t given, so William could be either my 4th great grandfather or his son, my 3rd great granduncle. Lewis was my 3rd great granduncle. George said he was born in Kentucky, had been in Texas 34 years and in Parker County 11 years. Charles said he was born in North Carolina, had been in Texas nine years and in Parker County seven years. Josiah? He said he was born in North Carolina and had been in the state and county 15 years. I haven’t found my Robertsons yet — they should have been in Lamar County, Texas, by then, but may not have lived there long enough to be qualified to vote there. There are many more voter registrations than just the Civil War-era lists, of course, and every one of them is a potential goldmine for a genealogist. California’s Great Registers, as one example. (You can find them, digitized, online at Ancestry, with an index online at FamilySearch.) Even Reclaim the Records has gotten into the act, with New York’s voter registrations from 1924 now available on Internet Archive. Any time you can nail an ancestor’s feet to the floor in a particular location, and get extra information like year or place of birth to boot, it’s a good thing. So as we ramp up to our own votes here in our own time… don’t forget to look back at the times when they were recording the vote in the past. I am just starting to follow various genealogy blogs, yours being one. Are there voting lists for non-Southern states? Many states do have voting list data that’s available. Doing a catalog search at FamilySearch for voting list should prove illuminating. Thank you for the information on the military districts. I found my 3rd great grandfather in the Georgia, Returns of Qualified Voters and Reconstruction Oath Books, 1867-1869 (digital images) on Ancestry.com. On 8 July 1867 he was listed in the Oath Book and on the Registered Voter list in Early County 854 Georgia Militia District. Excellent! Glad you found the information useful. Many states have voter registration books from around 1900 compiled under the “grandfather clause” acts. These records often name the father or grandfather of the voter dating from the 1867 era. The law had a sinister purpose (to deny voting rights) but was long ago declared unconstitutional. Interesting! Several years ago I was trying to put together my husbands Torrance family. I had a Luke G. Torrance whose middle name I had been unable to determine although I suspected it might be Gibbs, his mother’s maiden name. One day, out of desperation, I just googled his name as I knew it and came up with the name, “Luke Gibbs Torrance” on the 1870 San Francisco, CA, voter registration!!! I had also read in a piece by a family “researcher” who said that he had “disappeared from (Oregon) in 1869, never to be seen again.” So I also learned that the had come to CA from OR and there was a birth date, which would have been given by him. It was a great day for my research! !